Osechi Ryori is a special cuisine of traditional dishes eaten to celebrate the New Year from January 1st to the 7th. 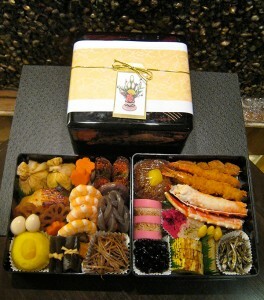 It is presented and served in layers of lacquer boxes called “Jubako”. It is a feast for family, friends and relatives who traditional visit each other during the first week of the New Year in order to spread well wishes of good harvests, prosperity and good health. This tradition requires that all food preparation be completed by the last day of the year and menu items should last for at least the first three days of the New Year. This allowed housewives to relax and enjoy time with friends and family who come and visit during this special time.